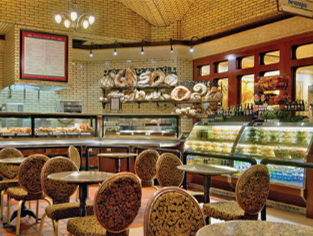 At JJ’s Boulangerie, you can enjoy a wide array of bakery selections, sandwiches, soups and salads all day long as you travel the Vegas Strip. Don’t count your calories here because JJ’s, which services all the restaurants at the Paris casino, is well known for its delectable sweets. Stop in for a chocolate croissant, sandwich baguette, or a freshly made salad and taste the flavors of a true French boulangerie without leaving the States. Hard to miss because of the sweet smells wafting from the open doors and the enticing display of fresh pastries and breads, you will be mesmerized by the delicious selections. My husband and I stopped at this restaurant for the first time years ago due to the fact that our last name is Boulanger. We loved the food there. Every time we go we try something different and we have always been pleased. Going to the Boulangerie is a Vegas tradition for us now.